Loose Stitches and Unraveled Threads: LETS CRAFT & CREATE CHALLENGE #128 HEY DUDE! That's my DT card. I hope you like it and it gives you some inspiration. There's a great prize to be won, so hope you come join us in the fun! Hiding In My Craft Room Challenge #312 - Always Cherry Crazy Nights! Sherry your dude is so adorable. What a fun card. Your card tugs at my heart strings even though my little boy is in college. It is so very sweet and well-created. Thanks for sharing at Jo's Scrap Shack! Thank you for joining us at Morgan's ArtWorld. Your card is super cute! 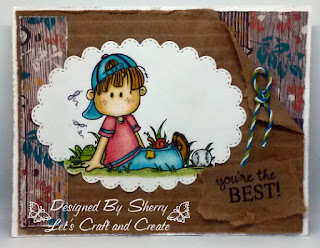 Thanks for joining Fun~day Friday at Jo's Scrap Shack!